Hi! I received a nice surprise in the mail! Check out the Candy Tuesdays Video! 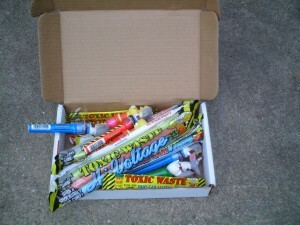 This is not the first time that I’ve tried the Toxic Waste Brand candy but there were some new sours that I did enjoy. In the video, I mentioned that I could not try the bubblegum because of my braces, however, after getting my brother to try it. He said it was SUPER SOUR, so I gave it a small try. Well I took a small bite off of the tip, and it was VERRRRRY sour. I mean I couldn’t hold it in my mouth LOL. I wish I tried it during the video because my face would have told all! Overall, I did enjoy the spray the most because its easier for me to eat right now and its sour! The Toxic Waste Nuclear Sludge Chew Bars were good also but not as sour as I expected. But the flavors really juicy! Here is the box of goodies that I received in the mail!